Last June 27th, 2015, about 02:48 UT,a fireball flew over Cuenca and Guadalajara Spanish provinces. This fireball was best observed from northern stations, but it can also be viewed at Calar Alto. 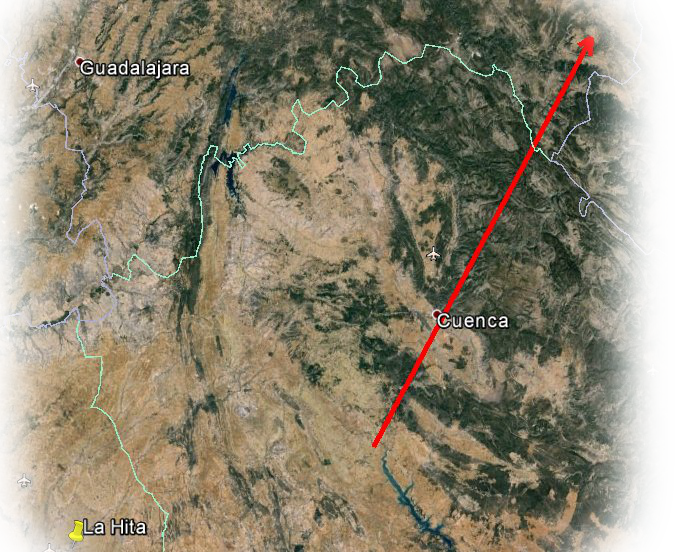 The object flew over Cuenca city zenith and then it enters into Guadalajara province, as you can see from the path image below. The first analysis achieved by Prof. José María Madiedo, suggest that the fireball was produced by a meteoroid from a comet with a Jupiter family comet (JFC). 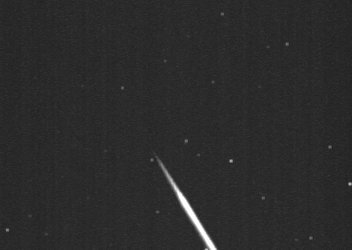 The object impacts with our atmosphere at a estimated speed of 104.000 km/h and the fireball started at an altitude of about 95 km over Cuenca province. The fireball moved northeastward toward Guadalajara province where it finished at an altitude of about 52km, in the vertical of the town of Adobes. The image below shows the path this fireball followed. And below you have the videos taken from our cameras. The first the one was taken with the north surveillance webcam. The building on the video is 2.2m Calar Alto telescope. It seems that the fireball is going directly against the telescope, but if you see the video in detail you may notice the fireball is moving from southwest to northeast.